One man who has seen a litany of charges and always manages to walk away clean is Darien Banks. The thirty three year old is tonight behind bars where he will serve a minimum of three years after being found guilty of drug trafficking. Banks was convicted for trafficking a little under twenty-seven pounds of marijuana which was discovered on the roof of his house. Banks appeared before Senior Magistrate Sharon Frazer today where he was sentenced prior to being fined an additional ten thousand dollars. 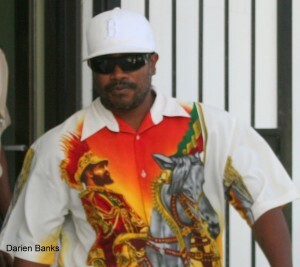 Banks, along with his wife Desiree Banks, were jointly charged on November sixteenth, 2010 with kept prohibited firearm and ammunitions following the discovery of an AR15 assault rifle with forty-two rounds inside a washroom at their residence on Oleander Street. In court, Banks argued that the property is not fully enclosed and can easily be accessed by passersby. But his argument didn’t hold water and in finding him guilty, Senior Magistrate Frazer told him that she believed the couple when they testified to being absent at the time of the search. Frazer, however, told Banks that she also believed that the bag of weed found on his rooftop belonged to him and that the officer conducting the search, PC Ryan Young, could not have planted such a large quantity of drugs at the residence. Banks also has three previous convictions for possession of controlled drugs before the court. If he goes crazy again-can you keep him locked up please? Just give him some injections and let him go pray etc like the rest.